Setting up London Historians this past two months has seriously curbed my book reading. Whereas I’d normally expect to do a book in a week, it has taken me nearly a month to read Brian Cookson’s Crossing the River, subtitle: The History of London’s Thames Bridges from Richmond to the Tower. The more eagle-eyed among you will have noticed articles on Old London Bridge and Westiminster Bridge which Brian wrote for us, which are posted on the web site here. (Acrobat (.pdf) files). So does this allow me to write a balanced item about the book? Absolutely. If I didn’t like it I simply would not have covered it. In fact, you will never see a negative book review on this blog, because what’s the point? I’m not a professional book reviewer and besides, I’m only interested in spending time on a blog post to share something I think you’ll enjoy. Cookson has arranged the book in geographical order, west to east, as the title suggests. This can be a little disconcerting for those used to reading history chronologically, but I think it works rather well. Each bridge has its own story, all are fascinating and no two are remotely similar. There are intriguing tales behind the funding of the structures (a dry topic amply and often amusingly redeemed by the author); arguments, lobbying, tolls and vested interests; war; the architects and engineers; the local areas and how bridges affected them. What struck me is how cheaply the earlier bridges were constructed compared to the mid-20th century onwards, even taking into account inflation. Also notable is how late the Thames got properly bridged, given its pre-eminent global status from the 18th Century onwards. Up until the early 1700s, Old London Bridge stood proud as the only road crossing in what is now the greater London area. Of the 40 or so bridges described, 19 were built during the Victorian period and a further 12 in the 20th and 21st Centuries. When it comes to feats of engineering, once again it was the Victorians wot done it. A very pleasing feature is that most of the prominent builders are given separate pen portraits covering their careers, among them Rennie, Barry, Jones, Clark, Locke, Walker, Page and, of course, Bazalgette and Brunel. 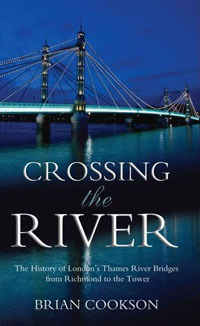 Cookson has an informal, easy style which pushes you along Crossing the River‘s 300 pages with ease and pleasure. Crossing the River: The History of London’s Thames River Bridges from Richmond to the Tower. Mainstream Publishing, 2006. ISBN 1840189762.